LightSpeed Retail offers the same level of detail and function, but aimed at the retail industry. You can manage your inventory with pre-loaded catalogs and a synced product history both instore and online. Accounting integration with Quickbooks takes only a few clicks. Manage special orders and discounts from your Mac or iPad, and include special touches like branded receipts. Powerful analytics and reporting on customer behavior complete this package. ​LightSpeed Restaurant is a business management tool for the service industry as well as a powerful POS system. It allows you to create floor plans which match your restaurant seating plan, control system access between your staff members and the ability to create and edit your menu online. Print your orders anywhere, seamlessly sending information from your front desk to the kitchen. Specific features for different types of business is what sets LightSpeed apart, for example a bar tab integration for clubs, or a bill splitting for café’s and dining. CRM functionality to better engage current customers, prevent customer loss, manage customer data, etc. Multistore functionality to transfer between locations and warehouses and kiosk/mobile POS functionality for things like tradeshow events. There are also different integrations available including QuickBooks, Xero, NimbleSchedule, Booxi, and MailSync or MailChimp. LightSpeed is technically a cloud-based POS platform with all information stored on LightSpeed services and synced automatically to each device you use. If you use a desktop device then you can also access LightSpeed through a browser interface. That’s not required if you prefer a mobile or tablet experience – the iOS app can be downloaded to your iPad to use as your POS device. In either case, you’ll need the additional hardware for checkout purposes including a register and printer as well as integration with a barcode scanner for retail establishments. Because it can be run in both formats, LightSpeed sells all the peripheral hardware in bundles if you don’t have it on hand. This includes the choice of the iPad POS kit (drawer, stand, socket scanner, receipt printer – iPad not included) or the Desktop POS kit including the draw, usb scanner, and printer. Like the iPad, you’ll need to source your own computer. Due to the browser interface you’re not locked into using an Apple desktop product. This gives you more freedom with the environment you’re working in. The front end register and the back end management tools are both very easy to use. Like many iPad solutions it’s beautifully designed and involves a very small learning curve to get to grips with. You will be guided through the desktop or iPad software to add inventory and manage payments. There are also a lot of customization options, for inventory, analytics and design. The iPhone app is also easy to use, although you cannot use it to take payments. Whether you’re working tableside with guests or ringing out a long line of customers during a big promotion, you want your POS to function effortlessly. LightSpeed offers an extremely intuitive design that’s easy to operate both in the front and back end. Because it’s primarily browser based, the setup and configuration is an easy step-by-step process with a wizard to guide you through setup from start to finish. The management functions are strategically grouped by categories in the back end, putting all the most vital information readily available as opposed to be being buried within various menus. Whether working in the front or in the backend, the buttons are easy to hit with clear and concise direction on functionality and progression through your sales process. It’s nearly impossible to get lost in menus. From product to employee management, customization and utilization of this POS platform is a breeze… and a pleasure to work with. Once you get the hang of it, it feels effortless. LightSpeed comes loaded with hundreds of pre-set printable reports that you can customize any way you like based on the date. Reporting is critical to running a business and LightSpeed definitely delivers. View profits by total revenue or margin, track effectiveness of promotions, schedule and task employees, run end of day and much more. The advanced reporting features of LightSpeed include a variety of responsive widgets so you can create a visual dashboard of the most critical elements for running your business. Any report can be exported to an Excel spreadsheet. Beyond the advanced reporting, it also offers features for selling services alongside physical products. That extends the use of LightSpeed beyond just retail to include any service-based setting like oil-change shops or any other business with service and repair orders. 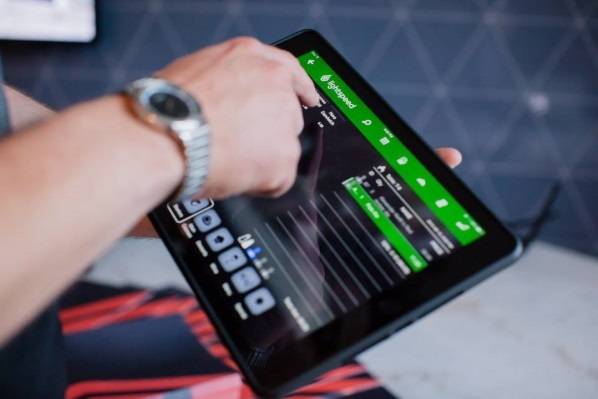 Don’t think that the software is limited to just retail or service – LightSpeed also offer customized POS software fit for the restaurant industry as well. LightSpeed boasts 24/7 support through their toll free phone number and contact form. They also have live chat available from the homepage. The staff are friendly and knowledgeable. You will receive set up help completely free of charge, as well as free updates with as much support as you need to learn any new functionality. With secure back up on the cloud, you’re never at risk of losing customer data or important inventory information. In terms of payment processing, you will be able to choose from dozens of integrations to find the right choice for you. Many of these take EMV payments, and are NFC ready for mobile payments such as Apple Pay. LightSpeed has a 14-day free trial so you can try out the POS before you make a commitment, making sure it’s the right solution for you. They then encourage you to sign a long term contract with them to get the lowest prices on a monthly basis. The standard term is 14 months, which will ensure you get the costings listed above. For hardware, LightSpeed guarantees a 30 day warranty of their own, which then transfers over to a manufacturer’s warranty. LightSpeed wins on features, with dedicated systems for retail and restaurant, as well as specialized options for subcategories within the restaurant industry, such as café’s or bars. We love how you can choose your own powerful integrations from over 250 partners and buy all-in-one hardware solutions directly. When you need to balance an efficient and intuitive interface with high functionality for front and back of house then LightSpeed is a great choice. Just be mindful that functionality may change or be limited by the type of business – a representative will get you set up with what makes the most sense for you. If you’re a small business or startup this likely isn’t the right choice due to the high cost. LightSpeed is a POS software provider based in Montreal, Canada. It was founded in 2005 with an aim to help local businesses recreate the convenience of an online shopping experience in a brick and mortar location.